[Jesus said,] "I will not judge those who hear me but don't obey me, for I have come to save the world and not to judge it. But all who reject me and my message will be judged on the day of judgment by the truth I have spoken. I don't speak on my own authority. The Father who sent me has commanded me what to say and how to say it. And I know his commands lead to eternal life; so I say whatever the Father tells me to say." Would you listen to a message if your life depended upon it? Would you follow the instructions carefully? Jesus makes clear that he speaks God's truth. What we do with that truth has eternal consequences and has benefits if we obey. While obedience may not be a popular concept in modern culture, Jesus reminds us that obeying his teaching is essential. God longs to save us through Jesus. He is not looking to trip us up on some fine point of Jesus' teaching that we missed. But, our hearts need to be willing to do all that Jesus says because obedience is a blessing — it protects us from some things that we should never have to face and leads us to blessings that only are found when we do things God's way. 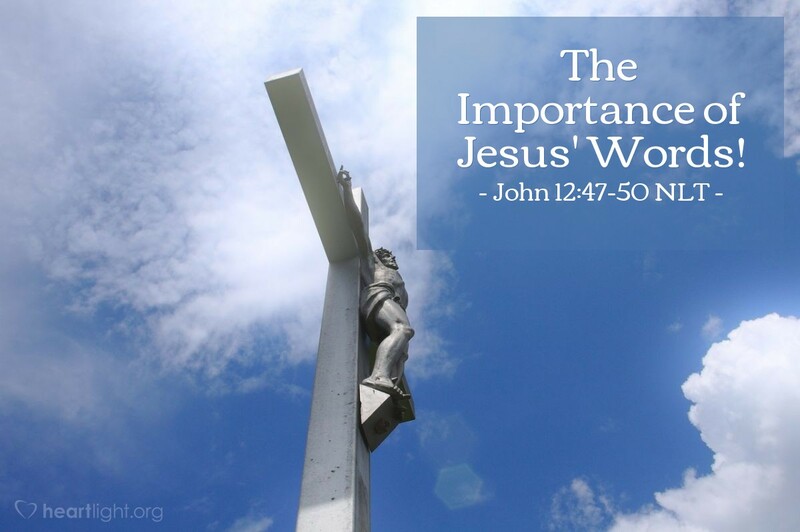 Jesus' words are important! We should listen to them as if eternity depends on what we do with them — because it does! Holy and loving Father, thank you for revealing your will in human words taught us by Jesus. Open my mind to understand Jesus' teaching more completely and open my heart to accept those words more willingly as I commit to live by Jesus' words in all that I do. In Jesus' name. Amen.